In a place where adventure and learning never hibernate, you can add land preservation to that list. 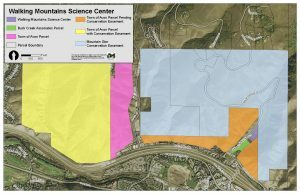 On Tuesday, December 20th, 2016 Walking Mountains Science Center purchased five acres of land next to their current campus in Avon thanks to the help of Eagle County, the Tang Family, Town of Avon and Eagle Valley Land Trust.“Our recent land purchase was an excellent example of how multiple parties can work together toward a common goal of conserving land and expanding the opportunities for hands-on natural science education for our community. With our programs at capacity, it was vital that we acquired more land for the expansion of our campus,” said Markian Feduschak, President, Walking Mountains Science Center.Walking Mountains purchased a total of 5.8 acres known as Lot 2 of the Buck Creek PUD, which sits in between their current five acres in Avon and the new Buck Creek Medical Plaza building. Of the 5.8 acres, 3.5 will be held in a conservation easement by the Eagle Valley Land Trust.Walking Mountains will develop approximately one acre for additional classrooms, office space and Graduate Fellow housing. The Avon Town Council participated in placing a conservation easement on 96 acres of town open space. The perpetual easement will be held by Eagle County.“This exciting effort permanently preserves land proximate to Walking Mountains Science Center. The meadow in the upper right corner of this picture at the Walking Mountains campus has been conserved forever as public open space. Program participants and visitors to the Science Center will forever enjoy a protected portion of the Buck Creek Valley in which to learn about nature, science and conservation,” said Toby Sprunk, Open Space Director for Eagle County.As part of the deal, the Tang Family donated $1 million and the Eagle County Board of Commissioners matched that amount, from the county’s Open Space fund, toward the purchase of the land to support education and permanently protect open space. 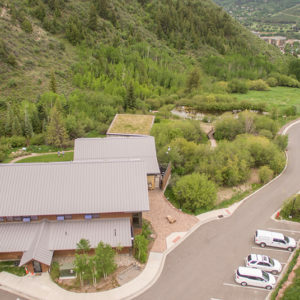 Eagle Valley Land Trust played an important role in the transaction, providing expertise for Walking Mountains and serving as a funding partner for Eagle County. A portion of the parcel in green at the lower right corner has been permanently conserved. “This was a unique transaction in the arena of conservation easements,” according to Jim Daus, Executive Director of Eagle Valley Land Trust. “Most conservation easements focus on the protection of larger landscapes and ecosystems, while this one’s primary purpose was science and environmental education. It’s important that conservation easements serve a variety of important needs and we are happy to be a partner of this one,” said Daus. “We are pleased to be part of such a unique land conservation project and are very thankful to Eagle County, the Tang Family, the Town of Avon and the Eagle Valley Land Trust for their support to make this land purchase a reality,” said Feduschak. Walking Mountains serves more than 94,000 locals and visitors annually through their variety of natural science education programs. A portion of that number includes Eagle County students who visit for a day of science exploration that is aligned with their curriculum. Last year alone, there were over 750 students on the wait list to attend a Field Science Program. Eagle Valley Land Trust was founded in 1981 as a 501(c)(3) non-profit environmental conservation organization and is state certified and nationally accredited. The mission of the land trust is to protect forever our scenic vistas, open spaces, historic lands, waterways and wildlife habitats that represent the uniqueness of Eagle County, Colorado and the Central Rocky Mountains for the education, enjoyment and benefit of people who experience this special place. The land trust permanently protects 32 parcels (over 7,700 acres) of land for the benefit of the public. These properties stretch from East Vail to the entrance of Glenwood Canyon and from Tennessee Pass near Leadville to Yarmony Mountain near the Routt County border. For more information about EVLT, please visit www.evlt.org or call 970-748-7654. North of the Town of Avon, CO. Click here for map.